Living in the Pacific Northwest, I’m surrounded all year by the colors, and scents, of greenery — evergreen trees and shrubs, green lawns (even in January). But there are cold-winter greens (often dark colored, dull, and chilled into scentlessness by frigid temperatures), and then there are spring and early-summer new-growth greens — vivid, dewy fresh and fragrant with zingy juices. Call me sappy — give me springtime and summery greens and lots of them. I’m a big fan of ‘green’ perfumes: I like sharp and punchy pure-green fragrances (full of leafy, stem-y, grassy notes). I like citrus-y green colognes too; even high-pitched floral-green scents appeal to me. And if a green perfume turns ‘soft’ or ‘wilts’ in the dry-down due to a touch of musk, that’s usually OK — as long as the green notes linger a good while, even in a spectral fashion. Byredo Green, developed by perfumer Jerôme Epinette, contains sage, petitgrain, jasmine, rose, violet, honeysuckle, vanilla, sweet almond and musk. Byredo Green opens with sensational petitgrain, which leads me to the question: where does Byredo obtain its fragrance notes? (Byredo Pulp’s citrus-fruit notes are also vibrant and seem to ‘percolate’ on skin.) After the petitgrain starts to fade, Byredo Green produces a rich green aroma, smelling like a cross between English boxwood and privet flowers. Honeysuckle, or its typical chemical “re-creation,” is certainly discernable and Byredo Green’s mid-development reminds me of Gobin Daudé Sous Le Buis (discontinued) mixed with Annick Goutal Le Chèvrefeuille. Byredo Green’s base notes smell of milky green almonds and the lightest, softest, almost-powdery musk. 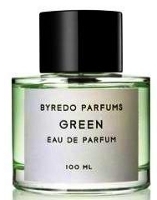 Green fragrances often ‘give up the green’ pretty quickly, but Byredo Green keeps the green accords going a long while. I’d classify Byredo Green as a ‘green-floral’ but it’s not too feminine for a man to wear; it has good lasting power and “quiet” sillage. Due to its high price and large size (100 ml of Eau de Parfum is $195), I was hoping Byredo Green would not appeal to me. Unfortunately, Byredo Green is great. What’s worse: it has invaded my consciousness at a time when I get weak-in-the-knees happy and lose all will power — spring is in the air. For buying information, see the listing for Byredo under Perfume Houses. 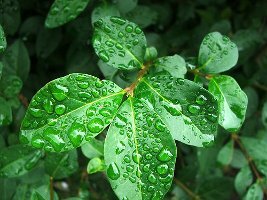 Note: top image is after the rain, the privet by only alice at flickr; some rights reserved. Gorgeous “green” pic, great bottle, great-sounding juic and a helluva great article. Thanks, Kevin. It's starting to green up nicely here in Vancouver, a few miles north from you, and I'm feelin' the green myself. Spring fever, baby! uh-oh, is that faint rustling the sound of your credit card slipping out of your wallet?! Great review! I have samples of all the frangrances in the Byredo line and Green is my favorite. I like Gypsy Water and am intrigued by Pulp but Green is definitely on my “to buy” list come Spring. Filomena: for me it's a wrestling match between Pulp and Green in the “to buy” department. Perhaps they'll kill each other and I'll save two hundred bucks????? btw, you know that LOCKDOWN thing is only moderately effective…and the next wonderful thing to come along might be more expensive!! Maybe you should arrange a bottle split? I will retest my Green sample following your review – I remember thinking this was the most persistent and greenest interpretation of green I had ever sniffed, and wasn't sure it was me, but that was ages ago. Hell, I just retested Light Blue and thought “This isn't SO bad after all”, having banished it to outer dark-indigo-ness a long time ago, so maybe Green's time has come too! D: the “to-buy” list is growing and growing…and spring is so BAD for budgets: want new clothes, new perfume, new plants for the garden, a trip…on and on. March…wasn't it only yesterday you were torturing ME with talk of a tea scent…tea scentS I should say? Vanessa: for every scent there is a season…or so they say! Wonderful review! I didn't have the willpower to resist Green, after months of sampling. I am now the proud owner of a bottle! I do not regret getting this beauty. A lovely review, K. I love the smell of boxwood. Ahhhh, boxwood and old bricks… shoots me back to college days every time I smell it, whenever I happen to smell it in real time. Maybe I'll sample… sure as heck not going to be able to actually buy it. Or even get in on a split. But I did get my Diorissimo, which is getting me through the spring yearnings (and does have, to my nose, quite a bit of that crushed stem sappy greenness, along with its relentlessly cheery muguet). Yikes, Kevin, you need to stop tantalizing us with the Byredos. I feel a need to get a sample of this and Pulp — thanks to you. Speaking of a green with boxwood, I happen to be wearing Mandragore today, which I find so captivating. I love greens — in scent and in life, and it's a pity that California gets so doggone BROWN for most of the year. When I go back to the Northeast in summers I'm in heaven and I also loved Portland; still need to make it to Seattle. Is it me, or do the bottles look EXACTLY like Malle with different labels? Speaking of Malle, at least Byredo costs less. That's something to encourage you. HA! yum, Diorissimo. I was struggling with that these last couple of days–but the CdG Carnation won—I should live in a world where I have an unlimited perfume budget. Funny you should mention it — the row of huge plum trees outside my office have just started blossoming. I love them, but am sad at how soon they're gone. Ba-dah DAH!! You crack me up, Kevin. And this sounds all too lovely. I'll go spritz on some Chevrefuille and hope the moment passes. Daisy, I think we ALL wish that! Diorissimo is lovely, currently trying to find EDP version. Joe: think the blossoms last longer up here…I know in LA I always waited for the almond blossoms in January…and they were gone in a week. mals86: you must live back East? I love the huge, ancient boxwoods in my home state of Virginia…and the old Colonial buidlings they surround. Robin-Great review. the idea for green is the COLOR. I think that its the best fragrance in his line. I envy you again for being able to wear well constructed fragrances that don't love me. I have samples from last year of Byredo's pulp, rose noir, chembur,green, and gypsy water and not one works on me. BTW Ben Gorham is a pretty savvy guy in addition to be a total hottie!!!! Joe: TRUE…but the Malle's at least have the travel sizes! ahtx: the Annick Goutal is a great alternative to this and smells SO spring-y. memechoses: in these days of too many fragrances at too high a price I'm almost THRILLED if an entire line doesn't work on, or for, me! Oooh, I hope so! C'mon. What's better than tea, particularly after a long winter when you haven't been wearing it much? Kevin, I am in the NW too and the first hints of spring have me giddy. Crocus are peeking up, my camellia is blooming…it's busting out isn't it? Lovely review, BTW. And beautiful picture you chose. Well, Lizbeth, since you are my evil scent twin I will let you live in my unlimited-perfume-budget world but just remember that I am Queen there. oh, and the sky there is purple because today I like purple and I am Queen. Good luck finding the Diorissimo edp—I spent hours and hours scouring the internet searching for Diorissimo ANYTHING and didn't find any EDP, only the EDT and that is getting more scarce…the best price I could find was actually Saks (because of their free shipping) –I'm not counting an evilbay auction that looked a little fishy to me… Anyhow, the word is that Dior has suspended production of Diorissimo (sometime last year) but no one seems to know why. I hope it's because some component has been unavailable and not a reformulation! It is my understanding that diorissimo is one of their consistently best sellers. If you have good perfume stores near you, perhaps you can find the edp. Today I got samples in the mail from Sonoma Scent Studio! It's so exciting, going to be hard to not try them all at once! Already sitting here in a cloud of FM Une Rose….tomorrow= SSS Velvet Rose! March: yes, I want the BLACKEST tea scent available…. Sounds lovely! Haven't had the chance to smell any of this line and hope to soon. Kevin, have you (or anyone) come across the scent Fantastic Man – created by Byredo in conjunction with the magazine of the same name? I have no idea what the notes are etc. but have seen it advertised in that magazine and believe its available in Barneys, Collette etc. Wow – I wish I had experienced the same thing you had, when I sampled Green. On me, it was flat, not very 'green' at all and vaguely forgettable. I want to re-sample this! I own a decant of Pulp and think it's fantastic. Another evocative review, Kevin, thank you. I see TPC carries this, which will no doubt save a lot of us from ourselves. I was unmoved by the reviews of Pulp for some reason, but this is a different story. I think I must have been a druid in a past life! Lockdown is no good if you remember all the cc numbers from memory. Exist: AH “green nature”! Put “Norma” on the stereo, annoint thyself with GREEN and host an absinthe party! *Invite me. Whenever I've mentioned the smell of boxwood to people before, I've gotten funny looks. “Boxwood has a smell? I've never noticed.” So I felt like a freak — until yesterday! Thanks very much. So which part of the Commonwealth are you from, if you don't mind my asking? I have it on today and it is lovely – I am appreciating it in a less amorphously “green” way than the first time round. I am not sure what I am appreciating exactly, but it is degrees of twigginess and leafiness, shall I just say! I should have an unlimited perfume budget too… I also wanted the CdG Carnation, but not as much as I wanted DSH's Oeillets Rouges — CdG was slightly bitter on me every time I tried it, but the OR was spicy floral perfection… too bad it's $135 for 1 oz! I'm still trying carnation 'fumes. DSH's Spicy Carnation (essense oil) was about 80% as good as OR and 40% of the cost, so it's top of the list right now. Sigh. I do so love carnations. platinum: perish the thought of YouTube nastiness (or Amazon.com review nastiness…HA!) Out of your choices I'll take Caballe for beautiful singing, Callas for acting…. nadia: I could go for a choisya perfume too. vanessa: glad it's better this time around…sounds like you appreciate the petitgrain…a great note in this one. mmmm, I love carnations too—the CdG Carnation on me was spicy cloves and carnation, very warm I love it! But I have made a note of the DSHs you mentioned and will have to try them out. I've been pouring over that site, Scentsplits, (what a den of temptation that is!) maybe you could pick up a split of the DSH there. ?? mals86: I'm from the Tidewater area. And how funny! I remember visiting Ash Lawn (James Monroe's house) near Charlottesville and loving the smell of the old boxwoods on the grounds! This is great! Nearly two years on the board, and I've finally found an evil scent twin….. Yes, I live life wishing perfume could fall from the sky, especially my latest two obsessions, Amouage Dia (very pricey), and Sous le Vent. But there is only so much space in my cupboard…..
FYI, I found another scent that might work for you, have you tried Frederick Malle's En Passant? Found a decant, didn't work for me but wonderful on my M-I-L…. How's the SSS Velvet Rose working? I turned a co-worker on to it, and she's in heaven. I love Diorissimo, but need EDP for staying power. Greetings Evil Scent Twin! Look at the good memory on you! I am trying the SSS Velvet Rose today—I just put it on about 10 minutes ago so right now it is a strong dark rose with lots of musk and a slight tang. So far I'm really liking it. On the other arm I've got SSS Vintage Rose which on me smells just like honey, ok, there's rose down in there somewhere, but mostly honey. This morning (my 6 a.m. perfuming–yup that's right, I never waste a perfume opportunity!) I put on some Penhaligon Elizabethan Rose—now that is a pure, unadulterated rose–reminds me of Crabtree &Evelyn Elizabethan rose for sure. Diorissimo is nice but not full bottle for me and the Edt lasts a good six hours—figures, doesn't it? you love it and it won't last, I only like it and it sticks like glue. I like the diorissimo I suspect because it reminds me of childhood—there was an old, old, old “shack” that I'm sure my brother and I should never have been anywhere near since a good wind would have brought what was left of it to the ground but it was surrounded by lily of the valley. We planned to dig some up and take them home, but we were maybe 7 or 8 so of course we never did. Anyhow, long story only slightly less long—its something I'd like to have but I probably wouldn't wear very often. I got a decant from TPC and that'll do. I'm not even certain if they make the Edp anymore—what about layering it with lotion? Do they make a lotion? Aside from that, O Evil Scent Twin….I like patchouli and hate cumin…how about you? aahhh….perfume falling from sky…dangerous, but I'm willing to work with it…..getting my bike helmet and a catcher's mitt…. I'm perfume-greedy so I hope they are the 100ml bottles….. I had never heard of Sous le Vent but it's on my radar now. ok, I had to wash off the SSS Vintage rose…the honey was too much for me……but I dug out that FM En Passant sample a few minutes ago— you know I like it!!! So far anyway smells a lot like Stargazer lilies on me. I will have to go see what the notes are. Today I am retrying the Green and also Rose Noir. Still love the Green – velvety smooth, sappy, processed hedge. The Rose Noir, which I accept is meant to be unisex, has an odd note that I don't care for – grapefruit is top of the suspect list.